Welcome! We are happy to have you, especially from WPAFB, as our neighbors. We hope you will find St. Helen a Catholic community to encounter God's mercy and love! Warriors to Lourdes, sponsored by the Knights of Columbus and the Archdiocese of Military Services, is an opportunity for veterans and families who have been wounded by war, whether physically, emotionally, psychologically, or spiritually, to go to Lourdes, France (where the Virgin Mary appeared to Bernadette) for the annual International Military Pilgrimage (PMI); international pilgrimage of soldiers, airmen, and sailors to find healing and peace. Click this to go to the website! 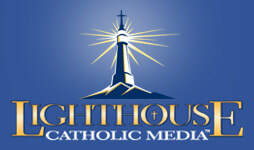 For military members, veterans, and their families; Lighthouse Media has provided free online streaming of some of their content. Click the icon to sign up! There's an app for that! To download the app click the icon above!